This book will fit in your pocket or bag and, in a lighthearted, sincere manner, support you in releasing your old patterns of self-sabotage and building momentum toward your goals! This book is not theory, but a manual for making change, and making it with results that stick. Cathy Fyock is the woman to get your book DONE! She’ll help you conceptualize what it will mean to your career or business to have a book and become a recognized thought leader. Run to Cathy’s Complimentary Strategy Session to find out how you can work with her! 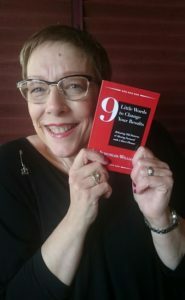 To order Nine Little Words to Change your Results click here.